Brought to you by popular brand Mystere Paris, this cardigan will let you sleep comfortably. Crafted from good quality material, it can be worn on a daily basis. 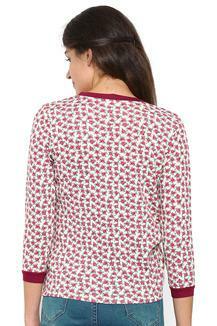 Besides, it flaunts a print pattern, which along with the open front style will lend you a trendy look. Modernise your nightwear collection by including this beautifully tailored cardigan. You can match it with a pair of track pants while relaxing at home.